The temperament of your Vizsla is paramount and, in the opinion of Jackie Perkins (GARDENWAY) this is still the most important quality for your consideration. After all, a dog may be the most beautiful one of its kind but, what good is he or she if you cannot live together harmoniously? Your Vizsla should be confident and friendly towards both humans and other dogs. How you manage your Vizsla will impact enormously on its temperament. Few people or animals respond well to harsh handling and there is little doubt that most ‘problem dogs’ are the result of poor handling, often from the owner’s ignorance. 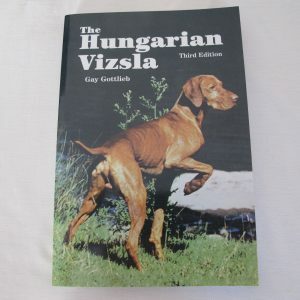 The Vizsla thrives on human companionship and it MUST be a valued member of your family, as so many owners will testify. However, in order to fulfil that special role, your Vizsla has to know his/her place. Of course, this is the case with all dogs but, many years of experience with the breed has shown that the Vizsla excels in cleverness and downright cheek! If you go out to work for long periods, a Vizsla is NOT the dog for you (and, really, no dog should be!). Left alone, in such circumstances, its intelligence will quickly come into play. If your Vizsla becomes bored, it may seek to relieve its boredom by re-designing the legs of your furniture or cupboard doors – at least those s/he cannot open and empty! Or, maybe, your favourite knick-knacks that its ever-searching gundog nose can sniff out might be preferred! And, toilet training will probably take for ever – if, indeed, it is ever learned at all! Such behaviour is hardly likely to endear him/her to you . . . However, if you are at home with your Vizsla during those early, formative weeks and months, you will not only have untold fun, as you realise his potential and capacity for learning, but you will also develop the essential rapport that will form an unbreakable bond between the pair of you. Take a look at the results of the Shows, Field and Working trials, Agility, Obedience and all the other, wide-ranging activities in which the Vizsla is involved. You immediately realise you have a multi-faceted animal in your life. Not only hard-working, but also intelligent, intuitive, inquisitive, instinctive and ‘in-your-face’. That’s your Vizsla and you ignore him/her at your peril!